After performing well in junior college at Northeastern Oklahoma A & M, Shockey moved on to the Univ. of Miami where he starred on the 2001 national championship team, catching 40 passes for 519 yards and seven touchdowns, and received first-team All-Big East honors. The Giants chose him in the first round of the 2002 NFL draft. Lively and demonstrative, as well as talented, Shockey drew attention almost immediately and was productive despite a foot injury. Giants went 10-6 to finish second in the NFC East and qualify for the postseason as a Wild Card entry. Lost NFC Wild Card playoff to San Francisco 49ers (39-38). A knee injury limited Shockey to nine games in 2003, but he caught 48 passes and was named to the Pro Bowl. Injuries would continue to be an issue, and he was also held in to block more in ’04, but Shockey remained an outstanding pass receiving tight end. He had productive seasons in 2005 and ’06, catching 65 passes for 891 yards and 66 for 623, respectively, and was named to the Pro Bowl after each. 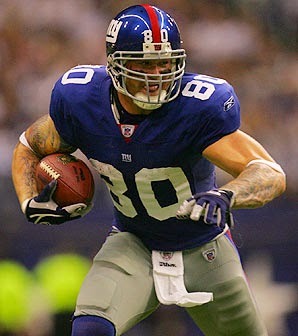 A broken leg kept Shockey out of the playoffs during the 2007 NFL Championship season for the Giants and he was dealt to New Orleans, where he continued to battle injuries for the next three years. He was still productive when healthy, catching 139 passes in 38 games for 1460 yards, and had a TD reception in the Super Bowl win over the Colts following the 2009 season. Shockey was released following the 2010 season and played one last year with the Carolina Panthers in 2011, where he split time with Greg Olsen. Overall, Shockey caught 547 passes for 6143 yards (11.2 avg.) and 37 touchdowns, with 371 receptions, 4228 yards, and 27 TDs coming with the Giants. He was selected to the Pro bowl four times, all with New York. Highly competitive, outspoken, and prone to controversy, he was also a talented receiver when healthy, but injuries ultimately curtailed his career.